Last night, the Hurva Synagogue in the Jewish Quarter of the Old City was rededicated after four years of rebuilding. 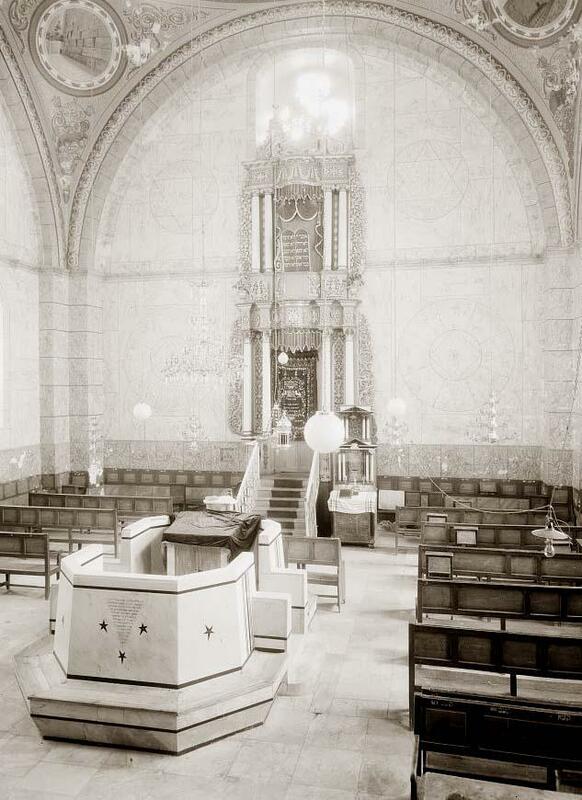 The synagogue, which was built in 1864, had been destroyed by the Jordanian army in 1948. While the story has had international media coverage, most outlets have been conspicuously vague on the destruction of this important shul. AP wrote that Hurva was destroyed "during Israel's 1948 war of independence", while Reuters simply acknowledged that it was destroyed "during a war in 1948." Neither outlets mentioned the Jordanians or the destruction of the Jewish Quarter. The battle for the Old City, and subsequent destruction of the Jewish Quarter and its synagogues is an important element in the Hurva story. The residents of the Jewish Quarter, almost all of whom were religious Jews who had lived in the city for generations, had ample opportunity to flee while the Old City was still under British jurisdiction. The majority chose to stay until the bitter end. The day before the surrender had been Lag Ba'Omer. The beleaguered Jews prayed for reinforcements. They were almost out of food and water; there was no electricity; the Haganah garrison had expended almost all of its ammunition; 300 soldiers had been killed, most of the others were injured but refused to leave their positions. The Jewish Quarter had endured two weeks of shelling and gunfire. 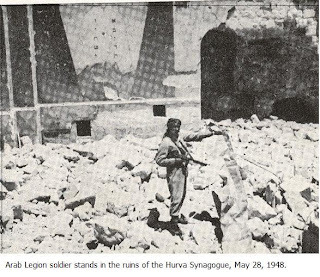 On Friday, May 28, 1948 the Arab Legion succeeded at controlling the main Jewish street of the Quarter and immediately destroyed the Hurva Synagogue (in anticipation of the arrival of King Abdullah). The International Red Cross had - to their credit - been trying to convince the Legion, at the request of the Haganah, to permit women and children to leave. The Legion repeatedly refused, demanding that there be a complete surrender of all Jews. All attempts to stop the Legion had failed, and with fighting now raging along a 20-mile front between Latrun and Ramallah, reinforcements were unavailable. By Friday morning "only Batei Machse, the Sephardi synagogues and Shaar Hashamyim Yeshiva remained in Jewish hands." More civilians were killed, including several women, a shopkeeper and a man helping the soldiers but the garrison refused to give up; and the Jordanians refused to permit civilians, now holed up in the synagogues, to leave unless there was a complete surrender. With no other possible recourse, Rabbi Reuven Hazan and Rabbi Israel Mintzberg put themselves into the line of fire to negotiate a surrender. They were shot at by a few of the Haganah boys - Haganah leader Moshe Rusnak was afraid their action would lead to a massacre of the residents - and forced back; but, everyone knew the situation was hopeless. After brief discussions, they were back on the streets 30 minutes later with their white flags (only to be shot at by Jordanians). They might have been killed on the spot. The Jordanians were only meters away from the Jewish positions. Instead, their intervention managed to convince both the Haganah and Arab Legion to temporarily stand down while civilians were evacuated, and the captured soldiers and men were returned to Israel in exchange for Jordanian prisoners several months later. "At 11:00am on Friday, Rabbis Reuven Hazan, 70, and Israel Mintzberg, 83, walked from one of the Jewish positions toward the Arab lines. They carried a white flag made out of a bit of once-festive tablecloth tacked to a stick. Although he was shot and wounded by a sniper, Rabbi Hazan called out in Arabic, 'Good morning. We have come to talk to you, and we want to see your commander.'" Mitzberg was held hostage while Rabbi Hazan retrieved the Haganah representative to negotiate the surrender. After 13 days of shelling (which killed or injured hundreds of civilians) and hand-to-hand fighting, "the exhausted Jewish garrison in the Old City of Jerusalem accepted the Arab Legion's surrender terms." On Friday afternoon "290 able-bodied men from 15 to 50 were taken prisoner and 1,200 women, children and aged were passed to the Jewish lines outside the walls with the cooperation of the U.N. representative and the Red Cross....the evacuation of civilians through Zion gate began on Friday evening and lasted until 2 o'clock on Saturday morning." Fifty-one of the captives were injured; three physicians and four nurses volunteered to stay with them. There are some reports that Jews were, in fact, invited to stay in the Old City if they promised allegiance to King Abdullah. I haven't been able to find out if anyone accepted the offer. An excellent first-hand account of the surrender can be read in 'Forever My Jerusalem' by Puah Shteiner. Further accounts are now online in archived editions of The Palestine Post. Photos of the destruction of the Old City and the surrender of the Jewish residents can be seen here. 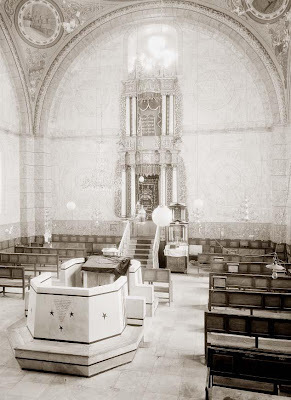 Emet m'Tsiyon also features an excellent photo essay called "The Hurvah Synagogue before Being Blown up by the Arab Legion of Transjordan, Courtesy of His Britannic Majesty's Generals and Officers" available here. Posted by Morey Altman at 3/16/2010 10:52:00 a.m.